The body of the former dictator will be taken to the El Pardo cemetery, assuming that the Supreme Court does not halt the process. The Spanish government is forging ahead with its plans to exhume the body of former dictator Francisco Franco despite a series of legal hurdles and an upcoming general election in April. The government of Prime Minister Pedro Sánchez, of the Socialist Party (PSOE), has decided to take Franco’s body out of its current resting place at the Valley of the Fallen memorial on June 10, said Deputy PM Carmen Calvo following the weekly Friday Cabinet meeting. The remains will then be taken to the state-owned El Pardo cemetery. Calvo said that Franco’s family would be given the option of holding a private ceremony at the reburial site. “There will be no public communication or announcement,” she said. But the decision could be blocked if the Supreme Court accepts the Franco family’s request for a precautionary suspension of the exhumation. Relatives strongly oppose moving the body from its current resting place, and they have been filing legal challenges to delay or stop the exhumation altogether. As for the possibility of a change of government after the snap election of April 28, Calvo said that the selected date of June 10 “falls outside the election period” and that any government will be under the obligation to execute the decision, unless the Historical Memory Law itself is modified. A little over a month ago, the government gave the family 15 days to select a new burial place for Franco, but warned that it could not be the family vault at La Almudena cathedral, in the heart of Madrid. Franco’s relatives have said that the only option they would consider is La Almudena, located in a major tourist area. 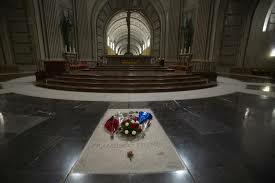 But the Sánchez administration wants to prevent the new grave from becoming a pilgrimage site for Franco nostalgics. A report by the Solicitor General says that Franco’s current grave is public, and that the Catholic Church does not have the authority to prevent workers from entering the basilica where he lies buried, as a religious official there has threatened to do. On February 27, a Madrid court temporarily suspended the license to lift the two-ton granite slab covering the grave, on the grounds that workers could be injured in the process. The attempt at moving the late dictator from a site that is a major tourist destination has become a tug-of-war between the government and the Franco family. The initiative, which was first approved by the Cabinet in late August, was one of the first government measures announced by Sánchez when he came to power in early June after winning a vote of no confidence against former Prime Minister Mariano Rajoy. In September, Spanish Congress greenlighted his plan.